I originally posted this during 2014, however given it’s popularity in search results I’ve revisited it, especially since I still like this one the best. 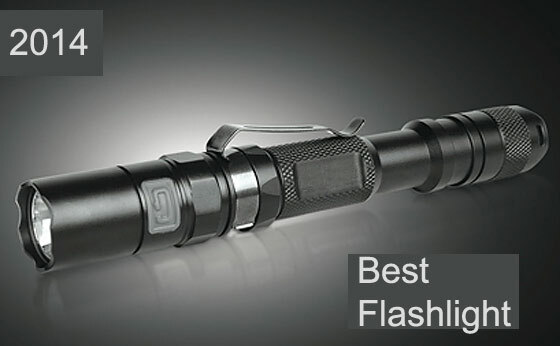 While there is no ‘best’ flashlight (because it’s subjective), we all have varying criteria. ‘My’ best flashlight of 2018 is based on my own personal opinion of must-have features, all bundled in a quality product that I can depend on. I chose the Fenix LD22, (Fenix LD22), to be the best – for the following reasons. AA batteries. The AA battery is the world’s most common battery and will be the easiest to acquire in a pinch. A good preparedness battery choice. Ability to fit Rechargeable AA batteries. Surprisingly, not every flashlight designed for AA batteries will physically ‘fit’ a NiMH rechargeable battery. LED. The light source must be LED (most are these days), which offers the best and efficient use of battery power. At least two brightness (lumens) settings. A flashlight with at least a high and low lumen output will provide needed flexibility for various uses. A brightness setting in the approximate range of 100 lumens. Through experience, I have found that a flashlight with 100 lumens of ‘brightness’ is very adequate for trekking (or tracking) through the dark – and this setting will provide a MUCH longer battery life than the higher settings. It’s a good ‘best’ balance of light output vs. battery life if I know I will be using it for a long period of time. A brightness setting in the approximate range of 300 lumens. Similarly through experience, 300 lumens is very bright for most flashlight applications. While the battery life will be shorter, 300 lumens will not drain the AA batteries too quickly compared with much higher lumen ratings. Again, it seems to be a best balance and trade-off. At least ~ 8 hours run time at about 100 lumens. If I am out most of the night, it is reassuring to know that I have enough battery life to power the flashlight for the duration. This is an important consideration. Tactical push-button tail switch. Used for on/off including momentary. Separate switch control for brightness ‘modes’. I find it very annoying to have to cycle the push-button of a flashlight to select the various brightness modes. Instead I find it best to have a separate (side) switch to change brightness modes, especially since I’m usually only using one mode for a given period of time. I prefer the flashlight tactical button to simply turn on and off. Lanyard loop and/or clip. It’s important to have multiple means of carrying or fastening the flashlight. Anti-roll design. When I put the flashlight on a flat uneven surface, I don’t want it to roll away. Must have good overall reviews. A proven track record of quality, reliability, and positive customer reviews (at least 4 of 5 stars). What Is The Best Flashlight? The Fenix LD22 flashlight meets all the criteria mentioned above, plus more. The flashlight has four levels of brightness as listed below with their associated run times. The 5 lumen output is an important bonus, as it provides a very low light to read a map, etc., without being highly noticed or ruining your night vision. Operating at 30 lumens is also adequate for seeing your way through at night. Although not super bright at this setting, the run time is incredible at 25 hours. Another bonus feature is it’s ability to accept various color filters. It also has two strobe modes (controlled via a side switch, along with the brightness levels – independent of the tactical push button). The customer reviews are outstanding, and Fenix has a long standing reputation of producing a quality flashlight (many models). It’s not a cheap flashlight in the vicinity of $50, however you do get what you pay for. There are lots of great brands out there, and I have many of them (suited for various purposes). There are flashlights whereby you could spend hundreds of dollars, or even just one dollar. But this one fits my needs nicely and is a good value for the money, IMO. What about you? What do you like in a flashlight? Do you have a best flashlight? Have the Fenix TK35. Love the lumens for checking the back yard at night for coyotes and prefer the 18650 battery for long life and rugged use. That’s a very impressive flashlight (the TK35) – and the turbo setting (1800 lumens) is incredibly bright! Impressive battery life too, and the fact that it uses Lithium Ion rechargeable batteries is convenient. What timing. I’ve spent the past three weeks trying to determine the best flashlight to replace one that just broke. We have older model flashlights currently but I wanted to upgrade to an LED model because of the longer battery life. It’s gotten to where we use our headlamp flashlights more than anything else. It’s so nice to have both hands available to do things like set up a tent in the dark. Obviously, there are times where people would want something different, but these are wonderful investments. We have four of those, they are great. I even carry one with me in my everyday bag. So small and light I forget I have it sometimes. Very bright for the size as well. Back up model light. I do have a couple fenix I picked up and there decent lights for the price. Ever seen or used. I figure if I won’t deploy with a piece of kit, why use it in my survival preps. Scarred up but I clicked the tail cap with my good hand and she fired right up! I hit a few hospitals along the way and it along with my whole Baggie of property was stolen sadly. My leather mag pouch, busted garmin GPS and even my blood type patch if you can believe that! A back up. Handed it to me and said thanks for your service. That’s it for me, great product and great customer service. 4 years ago a friend gave me a surefire, he had gotten several on ebay for $10.00 each. I’m a wildland firefighter and EMT. Best light I ever owned. recently lost it somewhere and just ordered another. 1000 lm, 3 power levels, strobe, (Which keeps the dogs at bay on emergency calls)and also SOS. Out performs all my standard issue lights which sit in my gear bags and never get used unless I loan them out. I have been carying the Fenix LD12 as my EDC light for some time now. It offers 3, 15, 60, & 115 lumens. It runs on one AA. I carry extra batteries in my laptop pack. When I need a smaller light I carry the Fenix E05 which is 27 lumens and runs on a AAA. I picked up a few EO5’s. decent light for the size and price. I wish more fenix lights had click on tail caps and not twist on and off in a certain time caps to adjust brightness setting. But sure hard to beat the prices for light to moderate duty lights. Love the Fenix “penlight”, fits into my shirt pockets, works well, hides in plain sight and is “light enough” to search (and I’ve searched) a few buildings with it while in foot pursuits with suspects, during daylight hours. Can’t say enough good things either about the SureFire line, work like a charm all the time. And, even the “old” Maglites have their uses and they are reliable and legal to “carry” in all 50 states and in D.C. Use them wisely on knee and elbow joints, they work extremely well in that role, extremely well. Thank you for your service and your sacrifice!!! Great articles! I am very attached to my Surefire Minimus however, I too have a fond respect for what I can get out a single “AA” battery. Check the specs on the Fenix HL-50 headlight. It satisfies all the requisites, plus it can be used as an EDC keychain light! Just picked up a Fenix LD 41 (4x aa batteries), hard to beat this flashlight! Over 600 lumens, also the random strobe really messes someone up. It carries on your belt and in your hand weighs heavy enough to smash someone if needed, hope it never happens though!. Get one if you get the chance it’s awesome. I really like the features you listed for this flashlight, but it seems a bit too long. I’ve been looking at Fenix LD12 and Coast PX45 but can’t really decide on which of the two to get. Have you guys ever had experience with either of these two? ZEBRALIGHT SC52.. single aa awesomeness. If your willing to find out for yourself just what this light is capable of then to you shall greatness be revealed! ! Thanks for all the info. Have been needing a good flashlight for so long and didn’t know what to try. AA lights are probably the best bet for emergencies and survival type situations. The cells are abundant and virtually everywhere. With that said, I’d argue that Fenix is one of the best companies out there based on: 1) durability 2) longevity 3) price point and 4) general customer satisfaction. E12 – The quintessential pocket flashlight. Intuitive tail switch, 120 lumen max and a nice tight beam that has enough kick for a variety of tasks with a single AA. E21/E25 – 2 AA light with a traditional thin barrel, flared head. The E21 has a tail switch; the E25 has a side switch. Nice wide beam, prominent hot spot and good throw. E41 – “Soda can” style design; wide, short and stubby. 4 AA that kicks out 1000 lumens, reaches almost 1000 feet and has a wide search light style beam. LD41 – Same wide, bright light as the E41 with a more traditional shape and tactical feel with a tail switch. If you want a AA monster I believe some of the old TK series lights were 8x AA and extremely bright. Most recently, the TK41c makes 1000 lumens, throws a beam over 1500 feet…all with 8 AAs.